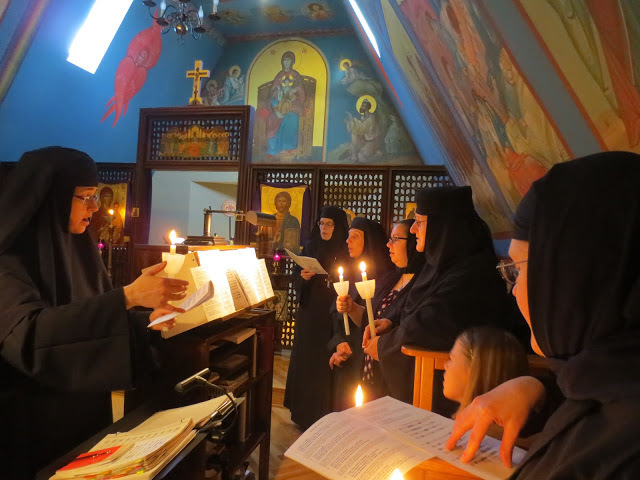 We're pleased to feature on this page various articles on monastic life, in addition to our special sections below highlighting some of the Orthodox monasteries in the region. Pilgrimages to Orthodox monasteries have been a key component of Orthodox spiritual life for over 1500 years, and here at Christ the Savior-Holy Spirit we keep that practice alive with an annual group pilgrimage. Many of our parishioners make private pilgrimages to one or another of these oases of peace and the life in Christ, and some of our past parishioners have gone on to enter the monastic ranks themselves. Please contact Fr. Steven if you are interested in learning more about Orthodox Christian monasticism. It is an axiom of Orthodox Christian Spiritual Life that the health of the local parish can be inferred from looking at its relationship to nearby monasteries. This does not mean that the monastic life is 'more spiritual' than married life or parish life, or 'better', or more 'holy'. The proof of this is that there is actually only one 'typicon' or 'rule' for the order of services in the Orthodox Church, which is the same for monasteries as for parishes. Monasteries do strive to follow the typicon as fully as possible, usually resulting in 3-6 hours a day being spent in the divine services, sometimes twice as much during Great Lent. The monastic call and vocation is seen to be a radical embracing of Christ's words, "Go, sell all that you have and give to the poor, and you will have treasure in heaven, and come, and follow Me" (Mt 19:21). The monk or nun takes lifelong vows of chastity, poverty, obedience and stability. 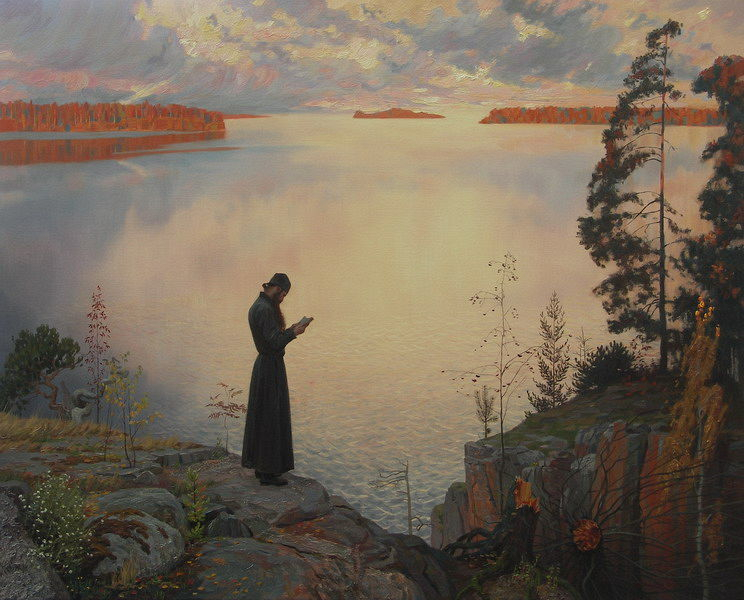 Monastic communities, while made up of those who have renounced the world, open their enclosure to those from the world who seek peace, spiritual counsel, and 'times of refreshing from the Lord'. The virtue of Hospitality is taken very seriously by monasteries, which are often known for their inviting guest houses and for feeding their guests. One can seek spiritual guidance from the elders or eldresses at a monastery, as well as be renewed through the sacraments of confession and communion. Thus the ties of a parish to one or more nearby monasteries often says something about the makeup of the parish, and its overall spiritual tone and vibrancy. We are blessed to be within only a few hours drive of several monasteries, with others not much further away. 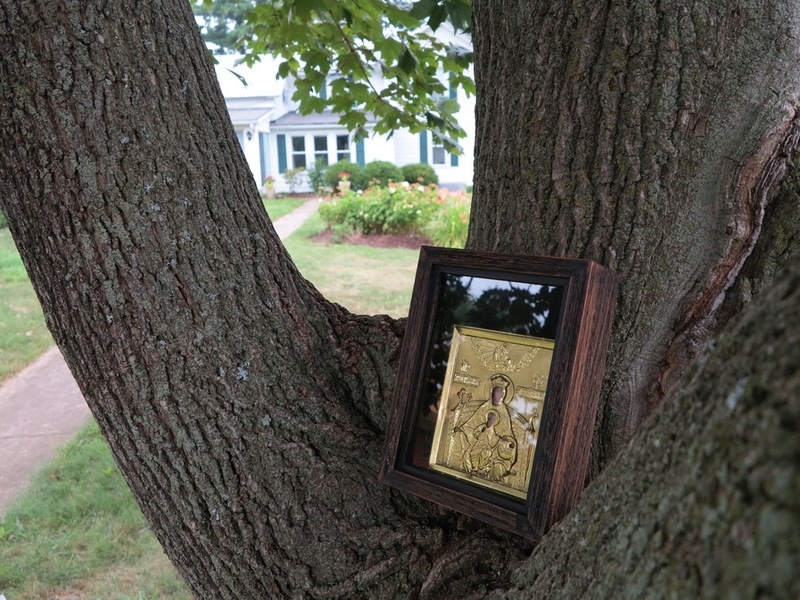 Christ the Savior makes an annual parish pilgrimage each summer to one of the women's monasteries listed below, and the men of the parish have made special retreats to the two nearby men's monasteries. If you are interested in arranging a personal retreat to a monastery, please contact Fr Steven for suggestions and guidance. 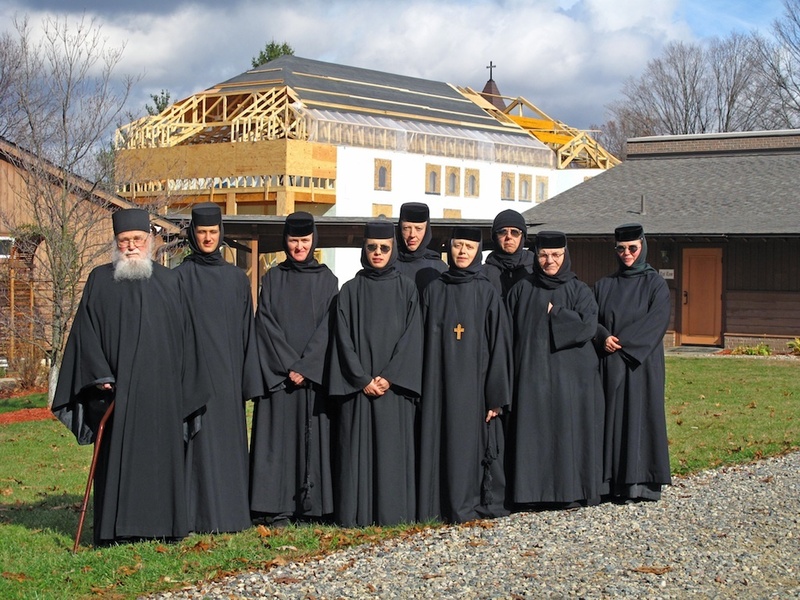 There are over eighty Orthodox monastic communities in North America. You can learn about them here, and plan your pilgrimages to nearly any part of the United States and Canada. This is one of the finest introductions on Orthodox Christian monasticism available, written by "one of our own", a monk from America, who, as abbot of the oldest monastery in North America, is helping traditional monastic life to flourish here in the "new world." "Monastic life is an enigma to the modern world. Oftentimes, even those in the Church are led to wonder what such a life as monasticism is 'worth'. What does it do? What kind of product does it have to give to the world? "For the monastic life is nothing else that 100% Christianity 100% of the time and is the epitome of the Gospel message lived to its fullest extent." Available as an eBook for Kindle from Amazon for $2.99. The Orthodox Monastery of the Transfiguration is a monastery for women under the jurisdiction of the Orthodox Church in America. 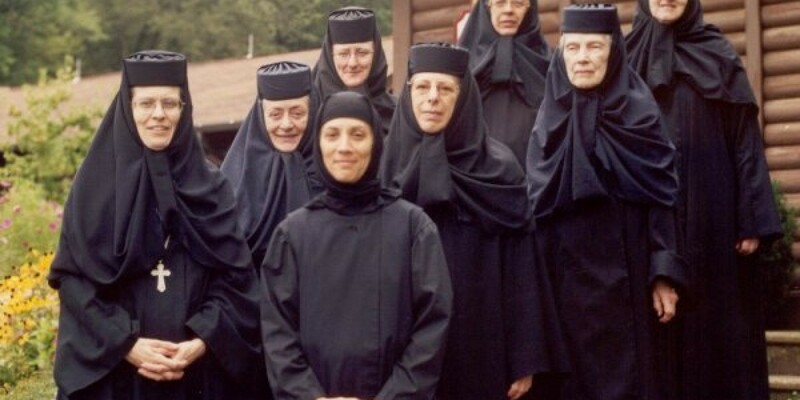 It was founded in 1967 by Mother Alexandra (the former Princess Ileana of Romania) whose dream it was to provide a place where American Orthodox women from all ethnic backgrounds could come to live the monastic life and benefit from a liturgical cycle in English. Since that time, her vision has been fulfilled. 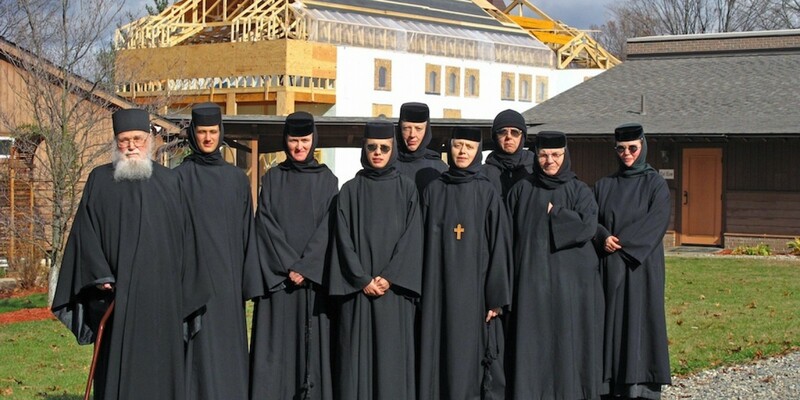 The nuns, the majority of whom are converts to Orthodoxy, as well as the monastery's many visitors, span a variety of backgrounds. We welcome a great number of non-Orthodox visitors as well. Mother Alexandra was the first Abbess, followed by Mother Benedicta who arrived in 1978 from Varatec Monastery in Romania. Under Mother Benedicta's leadership, a complete cycle of liturgical prayer was established and the strong monastic tradition she had lived in her homeland took root as well. 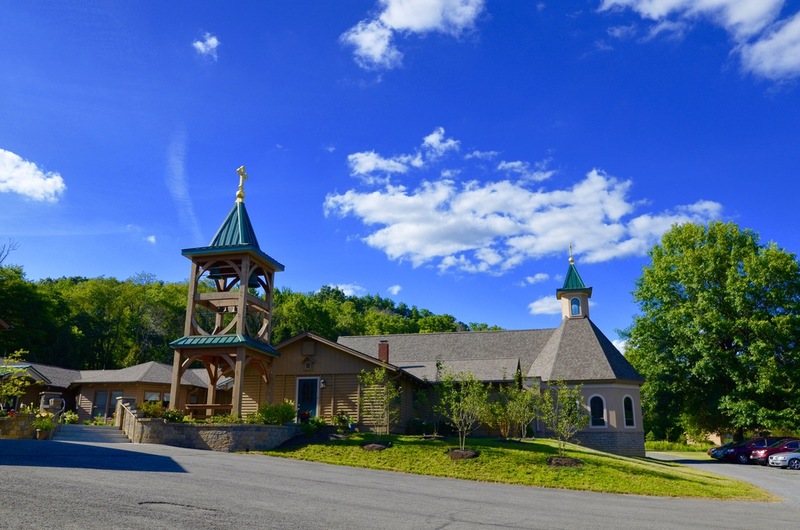 The story of the monastery began in 1978 when Mother Benedicta and Mother Gabriella left the monastery of Varatec in the northern part of Romania and came to the United States to join the community of nuns at the Holy Transfiguration Monastery in Ellwood City, PA. This is a monastery founded by Mother Alexandra, formerly Princess Ileana of Romania, who, understanding the need for monasticism in North America, came here from France to establish the first monastic community under the jurisdiction of the Romanian Orthodox Episcopate of America. They left behind in Varatec Sister Alexandrina, a long time spiritual daughter of Mother Benedicta, who was able to join them in the US, only a year after her tonsuring in Varatec. Sister Alexandrina, now the professed nun Mother Apolinaria, who, like Mother Benedicta, Fr Roman and so many others, had experienced many years of repressive treatment at the hands of the communist regime. They spent almost nine years in Ellwood City. 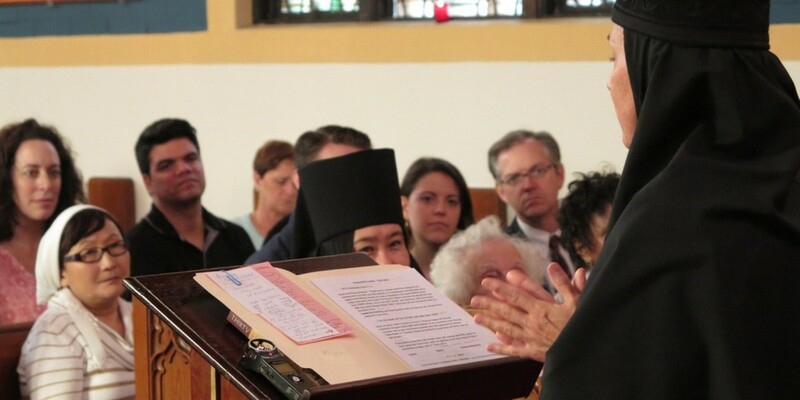 As would be the case later, Mother Benedicta's lifelong experience of monastic life brought to the Ellwood City community a wealth of knowledge based on the tradition of Romanian monasticism. At the same time they had the opportunity to become familiar with the American society in general and the Orthodox society in particular. The time in Ellwood City had prepared them for the years that were to come. With the blessing of His Grace, Bishop Nathaniel, the three nuns left Ellwood City in 1987 and went to Terre Haute, IN where they set the foundation for what was to become the Dormition of the Mother of God Orthodox Monastery. While they stayed in Terre Haute, they tried to resurrect a defunct Romanian Orthodox Church in town, but its survival was rather brief. After a long and tedious search in which they were assisted by a number of friends and acquaintances, they found the Rives Junction property. The property is located in a small rural town, set in sleepy southern Michigan, about seven miles north of Jackson. The establishment of the monastery at this particular location is not necessarily odd. Geographically, Rives Junction is within an hour or two of most of Michigan's major cities: Detroit, Lansing, Kalamazoo, Ann Arbor, and of course, Jackson. It is also within three to four hours from Cleveland and Chicago. In the spring of 1989, Fr Roman Braga joined the nuns at Rives Junction. Mother Benedicta assumed the position of Abbess and Fr Roman became the Spiritual Father. Read the full history of the Monastery here. Visit the Monastery's website here, and shop their online store for HDM books and monastic gifts. See a wonderful slide show of a recent Monastery Pilgrimage, with dozens of photos. 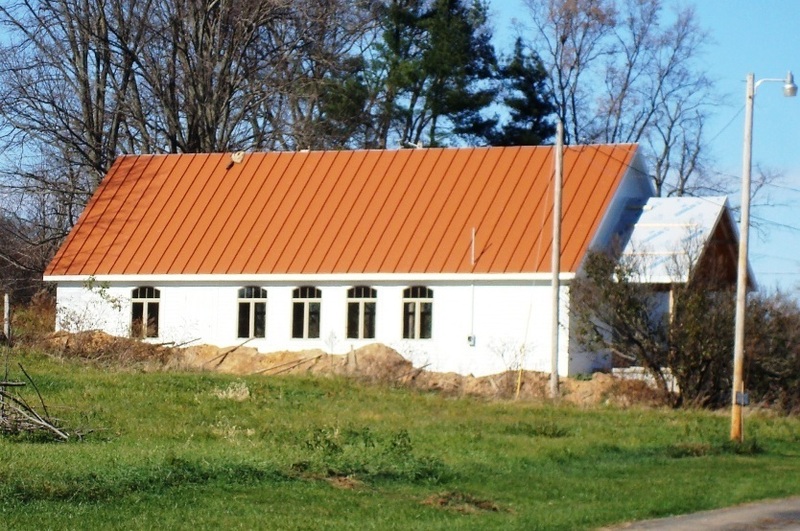 OCT 2012 - Read Fr Steven's reflections on the consecration of the new Monastery church. Fr Roman Braga, Mother Abbess Gabriela, and the Sisterhood, with the new church in the background. The Monastery of Saint Gregory Palamas was established in 1982 by his Eminence Metropolitan Maximos, the Bishop of Pittsburgh. The main church of the Monastery was consecrated by his Eminence Archbishop Iakovos in March, 1989. The Monastery is located in the agricultural country of northeastern Ohio, about 15 miles east of Mansfield. The regular cycle of monastic worship services (conducted primarily in English) provides a traditional prayer experience which is only possible in a monastery. Orthodox laymen can stay in the limited guest facilities for a few days, participating in the life of the Monastery — the prayer, the work, the silence, the direction of a monastic confessor. 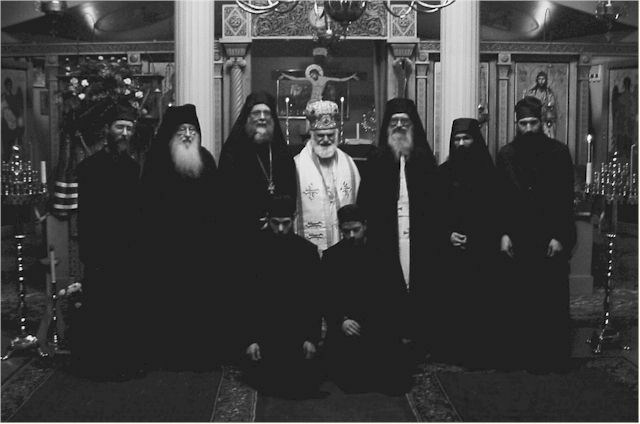 This is the ancient traditional service of monasticism to the body of the church, and is perhaps the Monastery’s special contribution to the Greek Orthodox Archdiocese and generally to all Orthodox Christians. Under the direction of the Abbot, Archimandrite Joseph (Morris), St Gregory Palamas Monastery has experienced a true flourishing in recent years. With the addition of four novices (three of whom have since been tonsured) and two candidates, the brotherhood has grown to ten overall. A new, expanded guest house and trapeza accommodates pilgrims for retreats and the annual pilgrimages. 2014 has seen work begin on an expansion to the monks' living quarters to better accomdate the grwing brotherhood; the expansion plans include an infirmary to help care for the monks as they encounter the infirmities of old age. Visit the Monastery's website and online store here, where you will find books and online articles published by the Monastery, as well as Athonite prayer ropes and incense, and icons mounted by the Monastery brothers. You may also contact the monastery to subscribe to its quarterly newsletter, The Talanton. Read the account of our 2012 Men's Retreat to St Gregory's, with photos. The Entrance of the Theotokos Skete is a women’s monastery located in the peaceful countryside of Ohio, between Cleveland and Columbus. Established in 2001 with the blessing of His Eminence, Metropolitan Maximos, and under the jurisdiction of the Metropolis of Pittsburgh, Greek Archdiocese of America, life in the Skete centers on the Divine Services, prayer, and work. Mother Theadelphi and the Skete's chaplain, Schemahieromonk Ambrose Young, welcome visitors. Visit the Skete's website, where you can subscribe to receive Fr Ambrose's sermons and spiritual reflections. The new church, nearing completion. Fr Ambrose serving in the little chapel. Holy Cross Monastery was founded in September 1986 by Hieromonk Kallistos (†1992) in House Springs, Missouri. The Hermitage remained in the Missouri area for the next 14 years. During this time the monastery expanded and grew. In 1999 the Hermitage doubled in size and all available rooms for the monastics were filled. An offer of land was made to the Hermitage and with the blessings of the monastery's Abbot, the ever-memorable Metropolitan (then Archbishop) Laurus of Holy Trinity Monastery, and the monastery's spiritual father, Igumen (now Bishop) George, the brotherhood decided to move the monastery to West Virginia. The move was accomplished on May 25, 2000. The Hermitage of the Holy Cross is an English speaking monastery under the jurisdiction of the Russian Orthodox Church Abroad in the Diocese of Eastern America and New York. The abbot of the monastery is Bishop George of Mayfield. The monks support themselves by manufacturing hand rolled incense in the ancient Athonite tradition as well as through hand painted icons, homemade soap, and selling other liturgical items and products. The Hermitage's remarkable DVD, From the Little Mountain, is one of — if not the — most significant and revealing cinematic explorations of Orthodox monasticism and spiritual life. Visit the Hermitage website, and their online Kiosk for books, soaps, devotional items and gifts. The Monastery of St Tikhon of Zadonsk, founded in 1905, is the first and oldest Orthodox monastery in this land and in the western world. Each year at the Memorial Day Pilgrimage, all are invited and welcome to come and share in the joy of the divine services, just as the thousands did at the first such Pilgrimage. Join with us in the age-old tradition of Pilgrimage--a journey to a Holy Place where saints have walked, prayed, and lived. Since the very first pilgrimage to St Tikhon's Monastery, this annual event has become a time where the hierarchs, clergy, and laity come in great numbers to participate in the prayers and worship. To be present in the beautiful Monastery Church--to participate in the prayers--brings joy, peace, and renewed strength to the soul. 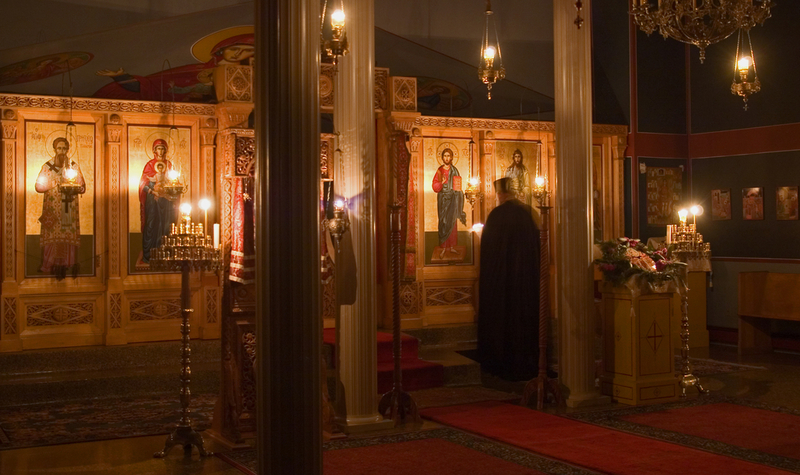 All who come are spiritually refreshed and nourished by joining their prayers to those of so many others, as they participate in the sacred prayers of the Vigils, the Divine Liturgies, and Akathist Hymn, and partake of the Holy Mysteries of Confession, Communion, and Unction. 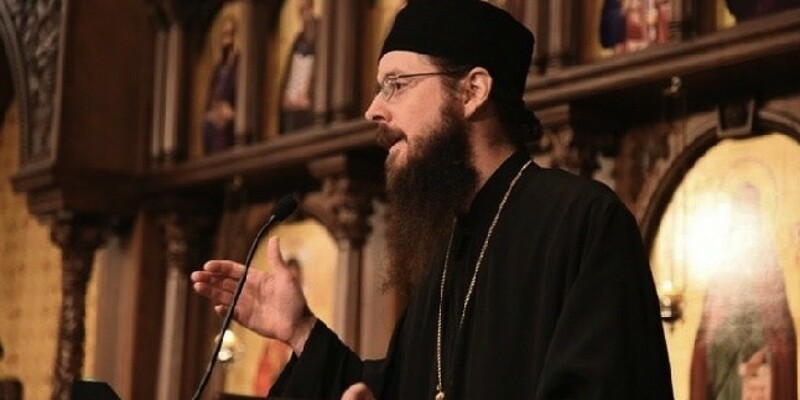 Knowing that monasticism is indispensable for the healthy flourishing of a local Orthodox Church, the young Hieromonk, later Archbishop, Arseny (Chagovtsev), who arrived in America in 1902, conceived the idea of starting a monastery in America. In his vision, the monastery would serve as a "mother house" for monastics who were engaged in mission work in various places in North America; they could return periodically for spiritual rejuvenation. Through Arseny's dedicated efforts, aided by Archbishop Tikhon's, suitable land was found: the Wagner farm in Western Wayne County, near the village of South Canaan. On June 26, 1905, the land for the new monastery was purchased for $2,580 by Archbishop Tikhon and Hieromonk Arseny--the founders of St Tikhon's Monastery. An Orphanage was started at the same time. The first Pilgrimage to St Tikhon's Monastery opened on July 29, 1905. On July 31 the grounds were dedicated by Bishop Raphael (Hawaweeny), and on that day, the first Divine Liturgy was served, in an open place on a knoll where the Monastery Church now stands. A cross was planted on the spot. Bishop Raphael was the chief celebrant; among the concelebrating clergy was Fr Alexander Hotovitsky and very likely Fr John Kochurov as well. In later years these two priests would be martyred in Russia, being formally glorified as saints in 1994. The services that day were in honor of St Tikhon of Zadonsk, who was Archbishop Tikhon's patron saint and partly for that reason, he was selected as the new monastery's patron saint. The official opening and consecration of the monastery took place on May 30, 1906. This occasion was the first of the annual Memorial Day pilgrimages. At the opening festivities gifts from Mount Athos arrived: an icon of the Theotokos "She Who Is Quick To Hear," and one of St Panteleimon; both icons are still cherished by the monastery community. Hundreds of pilgrims from local parishes and from New York carried the icons in a cross-procession beginning at Mayfield. 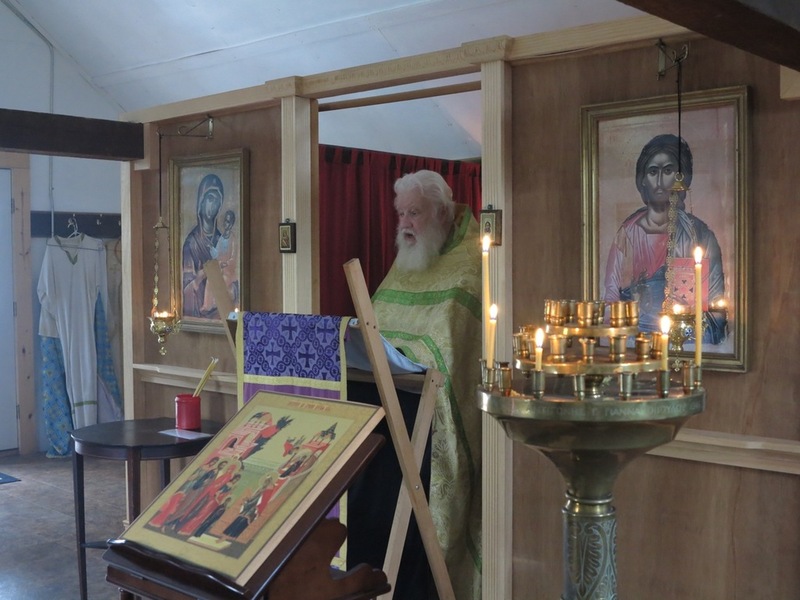 Travelling by train, the assembly was joined at Carbondale by Mitred Archpriest (Saint) Alexis Toth. The pilgrims--whose numbers had greatly exceeded expectations, so that two chartered trains, with twenty coaches filled to capacity--detrained in the forest near the monastery and the church hymns were sung as the procession--with the holy icons--advanced through the woods. After some eighty minutes, the pilgrims caught sight of a blue cupola with a three-barred cross, in the midst of a deep forest--it was the monastery! Two Liturgies were served. Archbishop Tikhon and some of the clergy joined in consecrating the Altar and celebrated Divine Liturgy in the new Church. Following this, a second group, headed by Bishop Raphael and Fr Alexis, served Liturgy under the open sky. Two novices were tonsured to the rank of Riasaphor. That same summer, 1906, Patriarch Saint Tikhon stayed at the Monastery, living with the monks and attending the services. 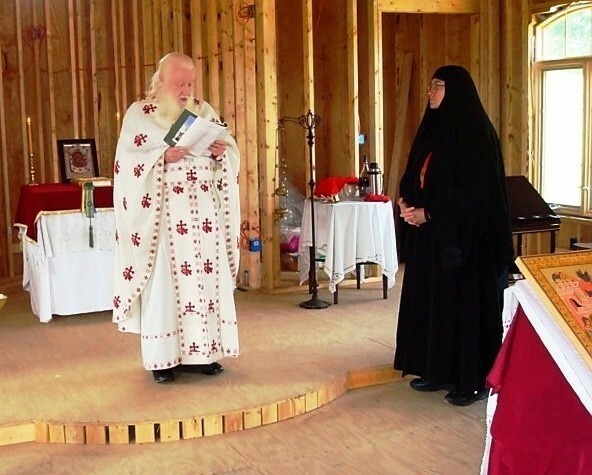 Continue reading this amazing article on the OCA page for St Tikhon Monastery. Visit the St Tikhon Monastery website, which has a wealth of information about monasticism and the spiritual life, videos of talks by such beloved luminaries as Fr Zacharias of Essex, disciple of Elder Sophrony, who was the disciple and biographer of St Silouan of Mt Athos, and an outstanding bookstore, with prayer and service books, spiritual works, music CDs, DVDs, and more.